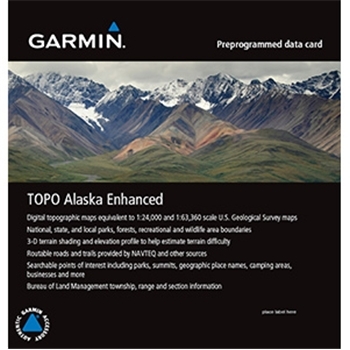 Get detailed 24K and 63K topographic maps for your next hiking or camping adventure in Alaska. This product features trails, terrain contours, elevations, summits, parks, rivers, lakes, geographic points and routable roads. It is all packed right on a microSD card with SD adapter. Provides topographic maps of Alaska, comparable to 1:24,000 and 1:63,360 scale USGS maps. Features national, state and local parks, forests, recreational and wildlife area boundaries as well as routable roads for accurate directions to your destination. Includes searchable urban and wilderness points of interest, such as geographical place names, camping areas and businesses. Features Bureau of Land Management township, range and section information.